Nigeria coach Emmanuel Amuneke says his squad will 'improve' for October's Under-17 World Cup finals in Chile. The Golden Eaglets are in Group A with hosts Chile, Croatia and the USA. The defending champions only just qualified for this year's edition after finishing fourth at the African championship in March. "We were erratic in the qualifiers but we will improve in Chile because we've been working hard to prepare," Amuneke told BBC Sport. "We have been drawn in a very interesting group against the host nation Chile and two strong countries in Croatia and USA. "The plan is to channel our preparation towards the first game against the United States knowing a bad start could have a negative effect on the team. "Importantly we need to remain focused, look at the areas where we can improve from the goalkeeping department to the attack." Amuneke was the assistant coach when Nigeria won the U-17 World Cup trophy for a record fourth time in the United Arab Emirates in 2013. The Golden Eaglet's class of 2013 include Manchester City forward Kelechi Iheanacho who was voted the tournament's Most Valuable Player, and Taiwo Awoniyi who has been linked with a move to Liverpool. 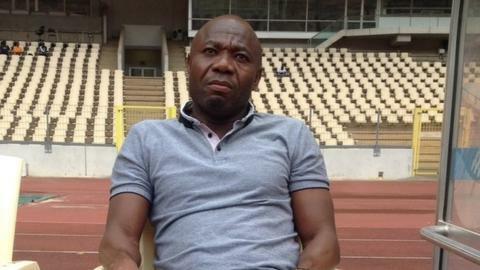 Despite the absence of notable stars in the 2015 squad, Amuneke knows there will still be pressure on his side. "I understand the fans' expectations and my job is to take the pressure off these young boys," he said. "Every winning team wants to win every tournament, but we should not create unnecessary euphoria because other teams have worked their socks off to get to Chile. "It was certainly not the performance fans were looking for at the African championship. "Nigerians deserve more and we should tell ourselves the truth that we are passionate when it comes to football. "A lot of factors affected the team in Niger and we must ensure it does not repeat itself again. "We should also look at the Golden Eaglet as the only African representative from the last edition that actually qualified for this tournament in Chile. "It indicates there is something positive about this team." Meanwhile, African under-17 champions Mali were handed a tricky draw last week for the World Cup that runs from 17 October to 8 November. Mali will face Belgium, Honduras and Ecuador in Group D.
South Africa, who were beaten African finalists in March, are in a group with Russia, Coasta Rica and North Korea. Africa's other team in the tournament Guinea have been drawn in a tough Group B alongside Brazil, England and South Korea.